In my few recent spells in the workshop, I've been getting frustrated with the usual problems of holding together hot bits of metal at 90 degrees long enough for the solder to set. In the past I've bodged up the usual wooden right angle jigs, used bits of Blu-tak and tape, built up a little stock of clamps etc., but it still seemed a bit haphazard and disorderly. So a few weeks ago I spent a few hours on a Sunday afternoon putting together this soldering jig which might be of interested to some of you. 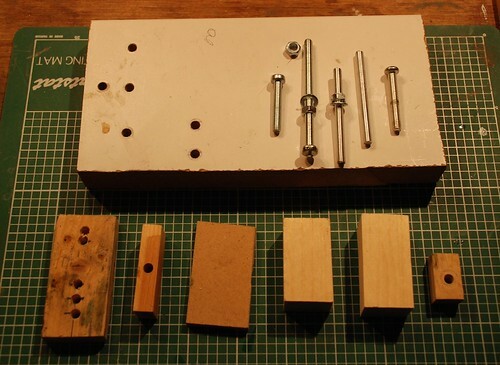 It's basically an offcut of 25mm MDF windowsill material, drilled with clearance holes for M5 screws (5mm, not surprisingly) and with the ends of the holes counterbored (8.5mm I think) to take an M5 nut which press-fitted by being wound into the hole with a screw - it's a tight enough fit in the MDF not to turn, and the forces involved are fairly light. I then gathered together some M5 screws (they're cheap and easy to find in a DIY store, and I think mine probably came from some old Ikea furniture or similar) and also cut a couple of long studs from a length of M5 studding (DIY store again). 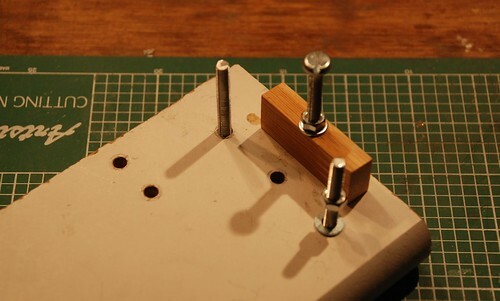 Together with a series of wooden clamping and spacing blocks it has before an invaluable soldering accessory. I've shown it in action doing the front bufferbeam on my 009 Backwoods "Lancashire" kit. I'm not sure if there is commercial equivalent, but if there is I haven't seen one. 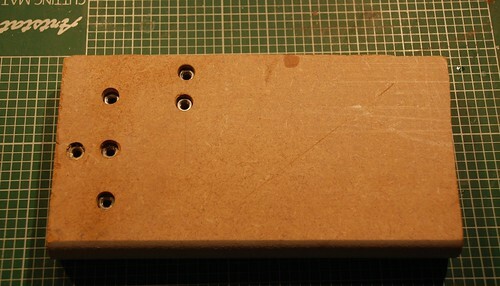 It'll hold most things and has the advantage that if I need more flexibility, I can just drill a few more holes. I use ordinary stripwood for the clamping and packing blocks after checking it for square - it seems quite accurate enough for this task. Clamping block fixed down with long bolt etc. This looks like one of those things we might want you to bring along and talk about for a little while too......! Good tool ideas in the blocks and board. Further enhancements - bury a few rare earth magnets in some of the blocks and the baseplate (fix with aradite or similar). You can then "clamp" anything made of mild-steel to them instantly. One trick with magnets on top of blocks is being able to "float" a small set-square in the air to help align the item being worked upon. Those mild steel blocks can, optionally, have a connection for a resistance soldering iron earth lead. 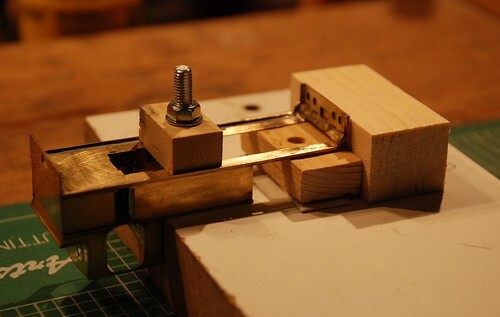 Magnets make a surprisingly effective addition to a MDF soldering holding jig.